As some of you may know I am what is known as a “gricer” – someone who looks to travel on all the railway lines possible! 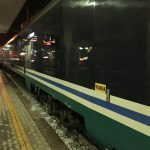 The opportunity arose to travel on an unusual route for passenger trains in the area around Pisa BUT only the overnight trains were using the route – and this why I ended up seeing Italy by Night…..
My chosen train was the Salerno to Turin train as I could add in a visit to Pompeii during the day before heading to Salerno. I booked my ticket online with TrenItalia, click here to see how I booked. 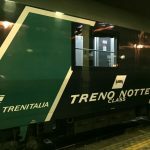 Train InterCityNotte 35996 was scheduled to depart Salerno at 21.50 arriving into Turin Porta Nuova at 09.10 the following morning. Arriving into Salerno at 20.00 I wanted to grab a bite to eat before barding the train as there are no dining facilities on the train. Unfortunately Salerno station does not offer many options and in fact most places were closed at 20.00 on a Sunday evening. I did find a nice pizza place, with free wifi. If I had more time I would have walked into the city centre which is very close to the railway station and has lots of dining options, I highly recommend Salerno as a stopover and base to explore the area. The train arrived into the station at 21.00 on paltform 2 which meant using the subway to get to the platform, unfortunately Salerno does not have lifts or escalators (as far as I could see) to reach the platforms. The train itself had 1 sleeping car, 4 couchette cars and 5 2nd class seating carriages – and looked remarkably clean and grafitti free! I was the only passenger on the platform at 21.00 so was the first to board. I was asked if I was in carriage 7 by one of the train staff and was welcomed onboard. 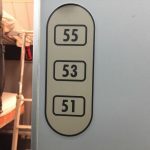 I made my way to my sleeping berth, number 51, the bottom bed in a cabin for 3. 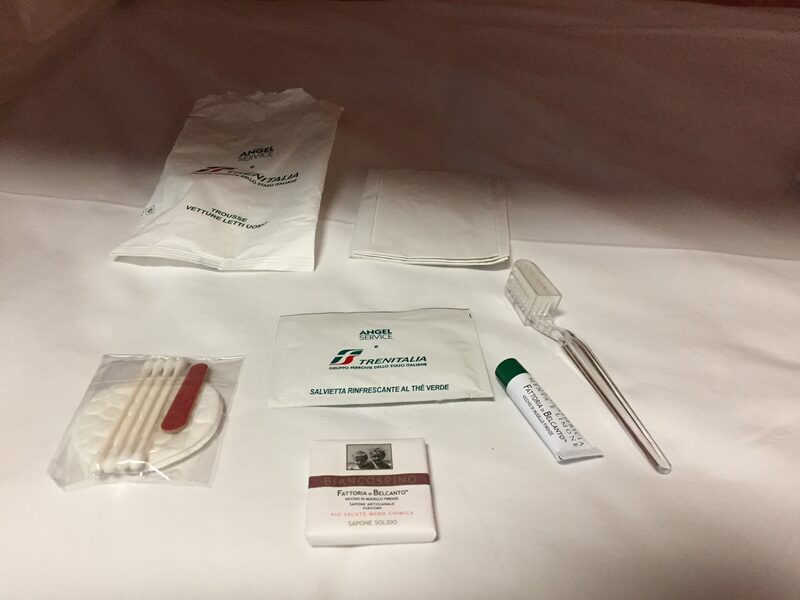 Basically in the Italian sleeping cars the same cabin is used for single, twin and triple occupancy with unused beds folded away i.e. if single occupancy the top 2 beds are folded away, if twin occupancy the top bed is folded away. If you are booked into a triple or twin and the other beds are unsold they will not be folded away. The night I travelled no single occupancy compartments were booked just twin and triple occupancy. A few more passengers boarded the train before departure and I found a copy of the occupancy list for the sleeping car and noted that no-one else was booked in my compartment, good news! I asked the sleeping car attendant if this was the case and he consulted his ipad (or equivalent) and said that there were in fact two people boarding at Naples who had made late bookings, bad news for me! Interestingly no earplugs or eyemask are included which would be useful! I had my own earplugs though. 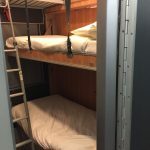 The cabin itself has 3 beds, a sink, a bin, a ladder to reach upper beds, there are reading lights for each bed and the a lock on the door. Storage space is somewhat limited when all 3 beds are booked with very little floor space and bags need to be stored over the door on a shelf. On departure from Naples the sleeping car attendant offered bottles of water and a croissant for breakfast. There appeared to be no tea or coffee on offer. A ticket and ID check was also done on departure from Naples. 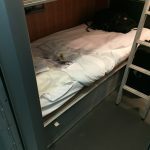 The ride itself in the sleeping car was quite comfy with non of creaks and bumps that I’ve experienced before – ot perhaps I was so tired I slept well. The other 2 occupants of my compartment didn’t snore and I was only aware of them leaving the compartment twice in the night. I went to the bathroom during the night and it was perfectly clean and acceptable. 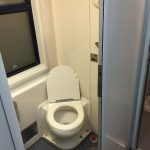 I did feel awkward opening the compartment door but it could not be helped! 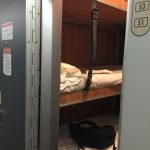 The sleeping car attendant knocked on the door 3 times during the journey to wake each of us up half an hour before arrival at our respective stations, which was a little annoying as both there were before mine! With the wake up knock on the door a carton of orange juice was offered, I think this was more an excuse to ensure that you were awake. Arrival into Turin was spot on time which suprised me as I understood that the overnighst trains were unrelaible.